Home Scandal and Gossip Belle Meade hatchet attack: Fired worker kills ex boss on the run. Belle Meade hatchet attack: Fired worker kills ex boss on the run. 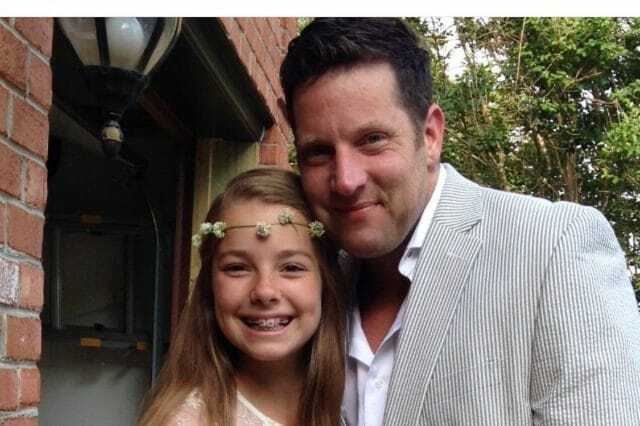 Pictured, slain Nashville, Tennessee man, Joel Paavola (pictured with one of his five children) who was slain at the hands of his former employee, Domenic Micheli. Belle Meade hatchet attack: What led to Domenic Micheli a former Nashville, ‘The Balance Training’ center, employee fatally using a hatchet on his former boss, Joel Paavola? A Nashville, Tennessee employee remains at large after using a hatchet and another ‘culling’ instrument to kill his former boss, who was leading a workout routine at his fitness center, early Monday morning. Nashville police tweeted their intent of charging 36-year-old Domenic Micheli with murder. Police spokesman Don Aaron announced the other weapon used during the attack was either a second hatchet or a large knife. Upon striking Paavola multiple times, police told of the ex worker fleeing the scene. ‘Micheli brutally, savagely attacked Paavola at the front of the business,’ Aaron said. Despite Paavola being rushed to Vanderbilt University Medical Center, the work manager was pronounced dead. Police issued a statement saying Micheli fleeing in an older model small silver Toyota Prius or Yaris. Paavola’s murder follows ‘The Secret Service,’ arresting Micheli in April for driving his car to a checkpoint near the White House and refusing directives to move. The incident led to Micheli being ordered by a U.S. District Court to undergo a mental competency test. It remained unclear whether Micheli was fired after the White House incident or prior, leading to him seeking redress at the government center. Micheli is also known to have been in Oregon in August 2017, police said. Paavola, who owned and managed the business, was remembered as a fitness guru who gave speeches about healthy lifestyle choices. They say, this is a fine mess he has made’. Of note, one friend of Micheli’s perhaps sensing something was imminent pleaded with the man to reach out to him. While Mark Mulry posted, ‘Call me bud, ASAP’. Of note, WSMV reported Paavola firing Micheli 14 months ago. Friends of Paavola told the media outlet that Micheli showed signs of paranoia and would post long rants on Facebook. It is thought Paavola was disconcerted by the employee’s mental state of mind. In the aftermath of a GoFundme fundraiser for the married father of five had raised just on $62.8K of a $75K goal, late Monday evening, EST.